I was suspicious when E-ink announced its newest color epaper display today; no E-ink screen could really look as good as what you can get from a high-quality inkjet printer. But now that I have seen some first-hand photos and a video of the screens on display at SID Display Week, damned if I wasn't wrong. Slashgear has gotten up close and personal with E-ink's new Advanced Color ePaper (ACeP, for short). 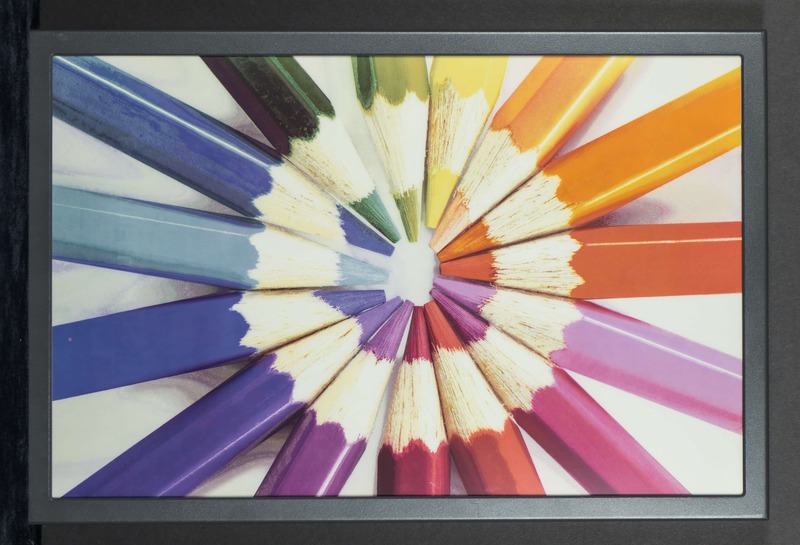 This wholly-new epaper does away with the color filter required for previous color epaper screens and instead displays a full color gamut, including all eight primary colors, using only colored pigments in each pixel. This means that the new ACeP screen doesn't have just white and black pigment capsules in each pixel like regular E-ink screens (or in the case of Spectra, yellow/red, black, and white). That sounds impressive, but as you can see in the video all those pigments come at a cost. The flashing you see in the video is the screen reversing itself in preparation of activating another color. In other words, thanks to the 8 pigments the refresh rate is very low, which is why this isn't going to be made into an ereader. E-ink has targeted the ACeP screens for the signage market. They've built 20" displays, with screen resolutions of 1600 x 2500 at 150 ppi, and they expect this technology to go into commercial production in the next two years. So this is not the ereader screen we have been hoping for. But even so, it's pretty. P.S. Do you think it would be any good for a monitor, or as a document display? If they can get the refresh rate low enough, this will affect LCD tablet sales. Presumably it is very visible in sunlight. About time an alternative to LCD appeared. Not good for photographers. Using reflected light means the colours would change as the lighting changed. You mean just like every single thing in the real world? If you’re being photographed, do you complain that the light being recorded is light bouncing off you? I’m 90% sure the colors *aren’t* white, black, red, purple, blue, green, yellow, and orange, as per your guess. Specifically, purple and orange seem weird. CMY (+ black) is used as a standard subtractive color space (for printing onto white paper, for example), hence why Teleread suggests those. I think this looks very promising. I could very well imagine having an ACeP screen on a 9.7¨ device running Android reading high quality colour magazines. (Like Magazine Littéraire for example !). This is not something for watching videos. It is just not going to work that way. Probably, like, ever. This would probably be available in about 4 years, and have at least 300 ppi by that stage. This is definitely a technology to keep an eye on for the future. Shocked that we have only progressed this far. If I would have read this article in 2013, I would have said, “wow, you are getting there, keep up the good work!”. It has a two-second refresh rate right now, half that number and it may be good enough for an ereader. Another nail to the EInk coffin. I think this would be awesome for signage. Heck, I found myself watching the flashes as it changed with a large amount of curiosity, wondering what was going to pop up next. Remember that article you wrote in 2013 saying “The Jetbook Color 2 Shows Why Color E-ink Screens Are a Dead End”? Yes, and I was right. That tech was a dead end. E-ink had to develop a whole new tech to make the idea work – and frankly, we still don’t know that it is workable in the real world. It might happen but I wouldn’t bet money on it. Their yields on monochrome are barely adequate. Going to single plane multicolor? In high volume? I’m not convinced it’s going to go far even as a signage product much less in ereaders. Existing LCD/OLED signs look great and work great. Just what i was hoping to find but came out empty so far. Depending on how far it can be calibrated this would be a great extra monitor for print pre-proofing and a wonderful little extra to impress customers when the view layouts we create for them etc. And also on the private side of things i would love to have some of these for my home. I can’t stand LCD/LED Picture displays and this would be the perfect alternative! Just imagine having a few of these in your home or your maybe a meeting room and being able to switch through print images to fit the occasion or person who is visiting with the push of the button. I hope this works out for them so we can look forward to affordable mass market products. Movie theaters would be a great place for these or any kind of store with frequently changing collections (I’m thinking of fashion collection advertising in stores). Would save a bunch in the long term compared to prints.